Together with the shrine Yuga Jinja Hongu 由加神社本宮 they are called Yugasan 由加山, a mountain region with a main peak of about 270 meters in Kurashiki. It has been a place for mountain ascetics since olden times. 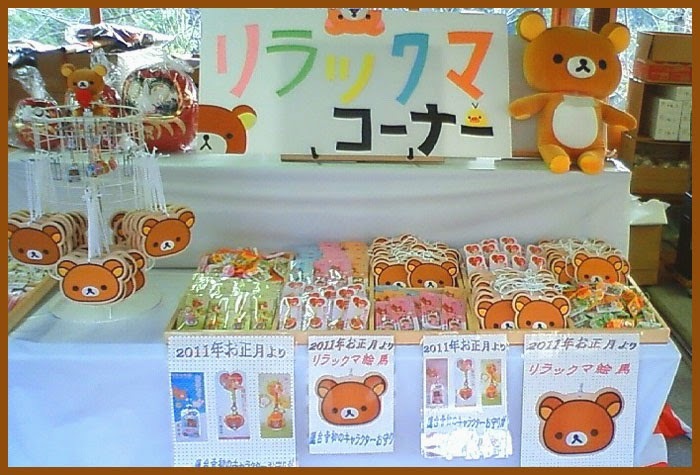 It is situated in the middlee of Kojima peninsula 児島半島 and surrounded by deep forests. In 733, priest Gyoki began to worship the two statues of Amida Nyorai and Yakushi Nyorai here as "Yuga Daigongen" 瑜伽大権現 . He did so on the request of Emperor 聖武天皇 Shomu Tenno (701 - 756) and build temple Yugaji 瑜伽寺 - 経尾山瑜伽寺摩尼珠院, now Rendai-Ji. 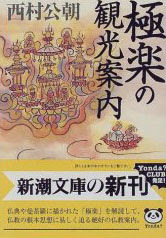 Now Yuga Daigongen is one of the three important GONGEN in Japan. During the Edo period, the Ikeda daimyo of Okayama province declared it as an important temple to pray in January, March and September and had the main hall and prayer hall built to do so. During the Meiji period, the division between Buddhism and Shinto brought and end to the syncretism and the Yuga Shrine was built in a new location, now named Hongu 由加神社本宮. In 1998 the Buddhist and Shinto part of the Mountain was divided again, not even allowing pilgrims to use the same parking space. 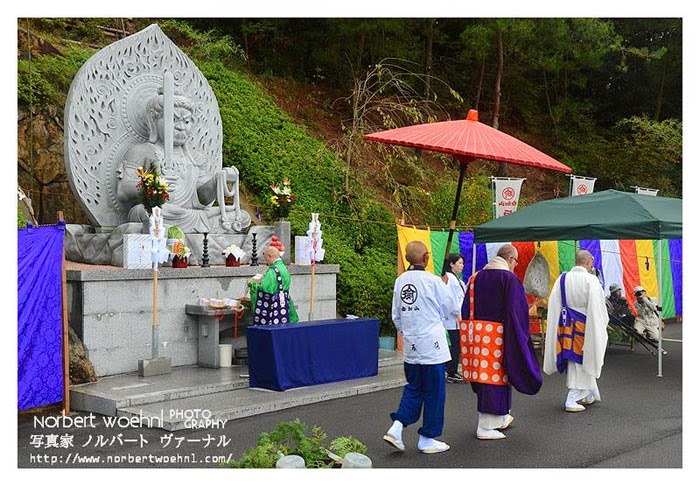 "pilgrimage to two shrines" "両参り.
. 行基菩薩 Gyoki Bosatsu . The town at the foot of the sacred mountain complex also thrived. 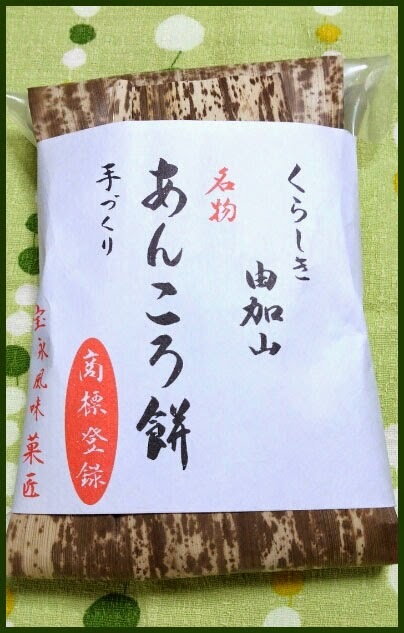 Now one speciality served in the tea stalls is "ankoro mochi" あんころ餅 ricecakes .
. O-Mamori お守り　Talismans from Japan . The sculpture, including the base and the surrounding flames is almost 8 meters tall. 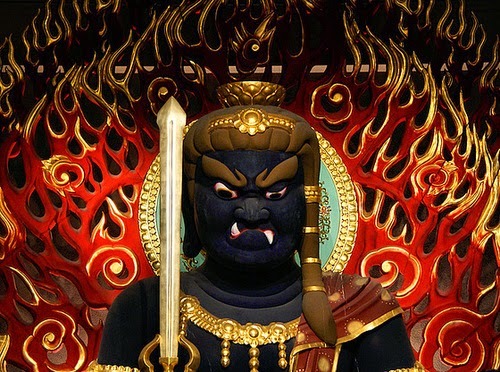 Fudo himself is exactly 366 centimeters,... one for each day of the year with an extra one to take you into the next year. 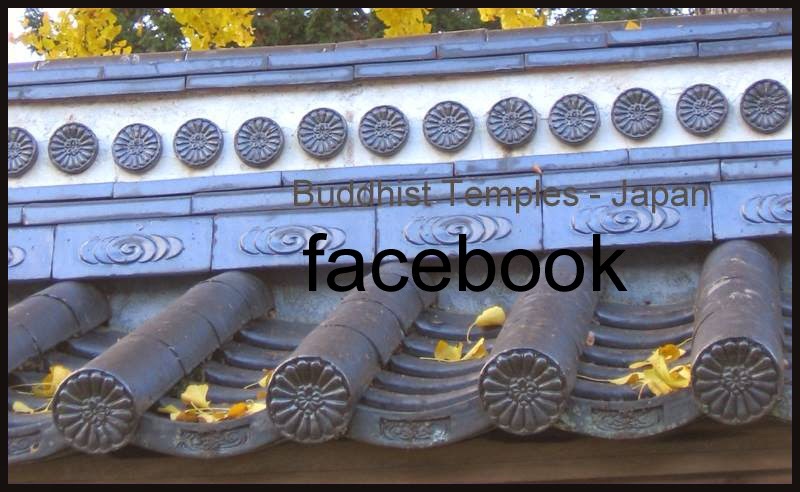 It was completed and installed in 2006 at the mountain temple of Rendai-Ji in southern Okayama. The statue was carved by Kyoto sculptor Araki Keiun. In front of the altar was a big wooden hand with a cord attached to it. The cord was made of five threads in the 5 sacred colors and it was connected to 5 colored ribbons ..... held in the left hand of Fudo. Rendai-Ji is part of a big shrine-temple complex on Mount Yuga. The site was once an important place of pilgrimage as pilgrims heading across the channel to Konpira-San would stop here first. 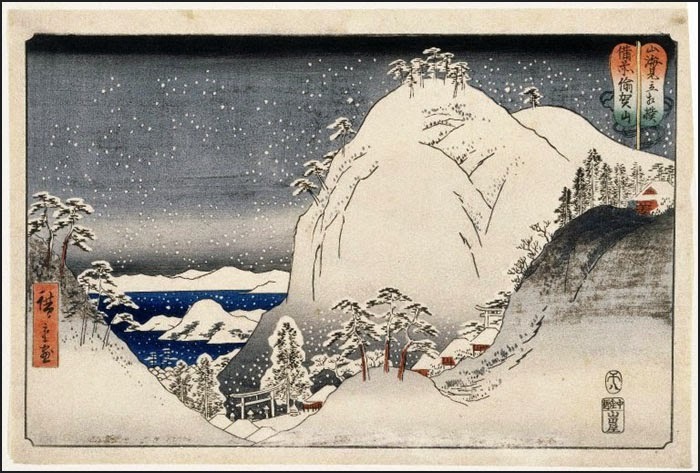 After the Edo Period its popularity faded, though Konpira's didnt. The temple is now number 6 on the Chugoku 33 Kannon Pilgrimage.
. Araki Keiun 荒木啓運 Araki Kei-Un . I was fortunate . . . to receive Tokudo Ordination as a Shingon Buddhist Priest. Belief in the incarnation of a Buddha or bodhisattva for the sake of bringing salvation to all sentient beings. Terms having the same meaning include gonge and kegen. There also arose the idea, as seen in the honji-suijaku theory , that the kami of Japan are likewise such manifestations or that they are one and the same, and so there were kami who took on the names of avatars. 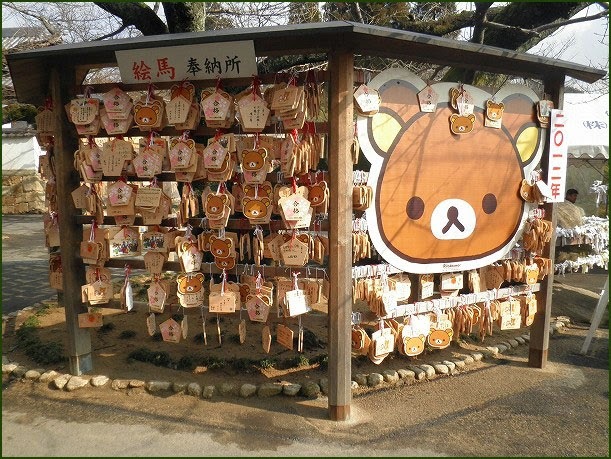 Since the Heian Period, these include: Sōtō-san (Izusan Jinja), Sannō ( Inage Jinja), Kasuga, Kumano-sanjo (Kumano Hayatama Taisha), Gion-sanjo, Atsuta (Atsuta shinkō), and Zaō. There was a particularly strong tendency to use Buddhist names for mountains that were the sites of ascetic practices. In medieval times, the practice of giving shrines the names of avatars spread. In general, it may be said that at the root of the various forms of syncretism, whether the title was applied or not, lay the concept of gongen. At the same time, however, in Yoshida Shintō, the superiority of the designation Daimyōjin ("great gracious deity") was advocated from the standpoint of Shintō supremacy, and the bestowal of that name was actively pursued. When Toyotomi Hideyoshi died, he became Toyokuni Daimyōjin; when, on the other hand, Tokugawa Ieyasu died, the Buddhist priest Tenkai argued from the standpoint of Sannō Shintō for the gongen name. As a result, Ieyasu took on the shingō of Tōshō Daigongen ("Great Avatar, Illuminator of the East"). With the separation of Shinto and Buddhism (shinbutsu bunri) by the Meiji government, gongen were abolished, and shrines came to be called jinja. 白山権現 Hakusan Gongen、熊野権現 Kumano Gongen and 山王権現 Sanno Gongen. 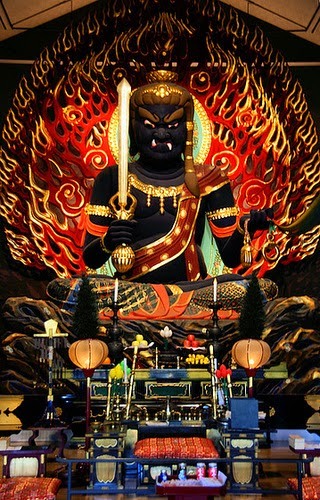 Shichisha Gongen 七社権現 The Gongen Deities from Seven Shrines .
. Iwakura matsuri 岩倉祭 "festival of the rock cave" .